International newswire service profiles the richest man in Brazil, Eike Batista. The ambitious industrialist is looking to build on a base of wide ranging conglomerates ranging from oil and mining to recreation and beauty care. Dec. 17/11 (Reuters) – Eike Batista sits atop one of the world’s most expansive industrial conglomerates, ranging from oil and mining to recreation and beauty care. Already the richest person in Brazil, he wants to be the richest in the world. His country has not seen industrial ambition on this scale since the 19th century, when a banker called Irineu Evangelista de Sousa built the first railroad, helped put steamships on the Amazon and linked South America to Europe with an undersea telegraph. Since then, Brazil has evolved from a slaveholding backwater addicted to foreign capital into an emerging global power. And yet in skeptical capital markets, Brazil is still trying to prove itself. The main companies in EBX, his conglomerate, are in start-up mode and most are posting operating losses. His flagship oil company has pumped no crude and his enormous port projects have loaded no cargo. His fortunes depend on Brazil’s continued economic success, and his huge bets on oil and commodities could prove highly vulnerable if world prices fall. The time has come, his critics say, for Batista to deliver results to justify his aggressive promises and the sky-high valuations of his companies. This is an excerpt from Reuters as it appeared on December 27, 2011. For updates or to read the current version of this post in its entirety, please click here. The Bahamas government recently signed a guarantee contract with the Inter-American Development Bank (IDB) for a loan totalling $81 million for an entire upgrade of the water and sewerage facilities on New Providence. The objective of the programme is to improve efficiency and quality of service provision of potable water and address immediate problems of sanitation. For a closer look at the terms of the agreement view PDFs of the contract here. The first few months of 2011 saw the start of some major developments in The Bahamas, particularly in tourism and infrastructure. 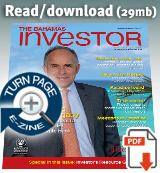 Here is a selection of the top posts on thebahamasinvestor.com during the first quarter of 2011.